Look at bottom of page for "The Medicine Walk"
When early settlers arrived in the United states there were more than two thousand tribes of Native Americans. Each tribe had(and in many cases,still does),it's own system of herbal medicine that was,in many ways, far superior to the European style of health care practiced by the pioneers. In fact,early settlers were startled to see Indians recovering from injuries that they considered fatal. The typical Tribal Medicine Man/Woman was as well equipped as any modern day pharmacy to treat a wide range of medical needs,ranging from the common cold to childbirth. The practicing of Medicine ways was a full time job and responsibility for the well-being and emotional balance of the Villagers/Tribe belonged to the Medicine Man/Woman. In return for his/her services, he/she was cared for by the members of the village. He/She always had food, shelter, his/her needs met, assistance when it was needed, and special Spirit gifts that showed the honor and respect of his/her people. This was how the Medicine Man/Woman was "paid". Although we have incorporated many of these herbs into our herbal traditions,many have been forgotten (or) are "now" difficult to obtain. The following list just goes to prove how sophisticated the Native American Traditional Healing/Herbal System really was. Used by the Winnebago and Dakota tribes to stimulate the removal of phlegm in asthma. The rootstock was official in the "U.S. Pharmacopoeia" from 1820 to 1882 when it was used in respiratory and nervous disorders and in rheumatism and dropsy. The Menominees smoked the pulverized, dried root for respiratory complaints while the Forest Potawatomis, the Mohegans, and the Penobscots smoked the dried leaves to relieve asthma. This is still a well-known and accepted remedy used amoung Herbalist today,and it works GREAT for asthma; I know because I have used it on myself and my children. The Catawba Indians used a tea of arnica roots for treating back pains. The "Dispensary of the United States (22nd edition)" states this drug can be dangerous if taken internally and that it has caused severe and even fatal poisoning. Also used as a wash to treat sprains and bruises. Arnica is still used by Herbalist and Homepaths today,but mostly as a rub or salve for sore muscles,sprains,etc. Mint is still in wide use today by Herbalist for Stomach problems and Nerveousness. This Herb is still in wide use by Herbalist today for a wide range of female problems as well as to ease the discomfort of child-birth,and speed up delivery of the child. This herb is still used by Modern-day Herbalists, for a wide range of things from allergies,to stomach problems. Boneset tea was one of the most frequently used home remedies during the last century,and is still used by Herbalist today. The Menominees used it to reduce fever; the Alabamas, to relive stomachache; the Creeks, for body pain; the Iroquois and the Mohegans, for fever and colds. This remedy is still in wide use today by Herbalist for Baby's colic as well as any stomach problem, nerveousness, or sleeplesness. You will find,even today, many cold and cough remedies that contain Cherry,Pine,and/or Sarsaparilla. Of-course,the Native Americans never had Diabetes,until they started eating more and more of the White man's food. Now Diabetes is a very big problem amoung Native Americans. The Plains Indians and Indians of the Southwest used the Prickly Pear Cactus,ground-up or pulverized,and drunk or eaten atleast once a day. The Mohegans allowed the ripe wild black cherry to ferment naturally in a jar about one year then they drank the juice to cure dysentery. Herbalist today use this in the control of pain and inflamation. This herb/ flower is still in wide use by all Herbalist world-wide; it is excellant for Liver, Kidney problems,and as a over-all tonic. 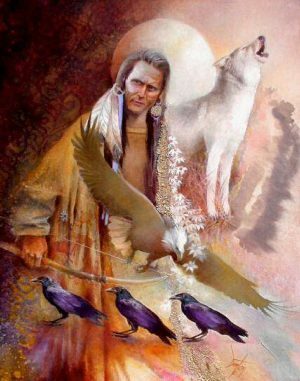 THE WAKAN CIRCLE--We are the "Old Ways"...Native American Spirituality; with love and respect--Learning to walk and teach "THE GOOD RED ROAD"
Adapted from The Findhorn Book of Connecting with Nature, by John R. Stowe (Findhorn Books, 2003). One of the oldest ways that human beings have sought Insight and self-awareness is by turning to the Living World,(Nature). This is a practise, well-known, and accepted by all Indigenous Peoples, although different Tribes and Peoples have different Ways/Traditions of connecting with Nature. The Medicine Walk is a simple technique to help you do the same. Traditionally, the Medicine Walk might last a full day or longer, and could include fasting from food in order to increase personal clarity. But you can learn the process in a much shorter time--even under an hour--and get satisfying results. And you can always consider doing a more extensive version in the future. 1. Place. For your medicine walk, go to a Natural area that feels Strongly Inviting. Praying and/or Meditating about this ahead of time, will help you know where to go. Let Spirit, Creator, guide you. It’s better to be away from human activity as much as possible, but if that isn’t possible, do what you can. Before you begin,(the Walk), take some time to get centered and aligned, both inside yourself, and with your surroundings. Focus your intention by following your breath until you feel quiet and ready. Tune in to the "Energy" of the place and ask it--verbally or silently--if it would be willing to help you. The positive feeling you get in response will be your sign to continue. If you have any doubt about the response,or feel uneasy for any reason, choose another place. 2. Intention. The most important part of your Medicine Walk is the clarity of your intention. To set your intention clearly, think of a question around which you’d like insight. IT could relate to any area of your life. The more specific you make your question, the clearer the answer you’ll get. When you’ve chosen your question, turn your attention back to the Living Environment around you. Either aloud or silently, ask this place and the Creatures within it, to help you gain insight around your question. Say the question aloud, at least once, to help yourself be as clear as possible. 3. Listen. When you feel ready, start to walk. Take all the time you like. Keeping silent will help you to maintain your focus on the question. As you walk, release any expectations about what you think you should find. Follow your impulses and let them guide you to whatever calls you. When something attracts your attention, sit with it. See what it has to share with you about your question. How do you feel when you’re with it? What insights come to you? The Medicine Walk draws on your imagination and symbolic awareness. The answers you receive may Not come verbally or literally. Instead, approach this communication as you might approach a dream or a painting. Let it speak to the intuitive, nonverbal parts of your awareness. 4. Gratitude. When you feel complete with your Medicine Walk, take a few moments to thank the place for the insights you’ve received. Use a simple, symbolic gesture to communicate your gratitude,(such as leaving an offering of Cornmeal, Sweet Grass, Lavender, Tobacco, Pine, or Cedar). This helps to complete your process and lets you return to the rest of your life with greater clarity. Breathe consciously and take a few moments to re-center yourself before you return to normal awareness. If you’ve received answers, write them into your journal. If your experience was less focused, record it anyway. In either case, allow yourself to stay open. Sometimes, the most dramatic Insights come to people After they’ve completed their Medicine Walk,(sometimes days, weeks, or months later),--either in Dreams or in some other fashion.